The development of tourism in the coming years offers new prospects for explorations, exchanges and encounters. But this development, if untamed, can result in serious negative impacts – economic, social and environmental- for the regions concerned. The concept of responsible tourism will act on these 3 fields to foster more respectful and equitable practices. 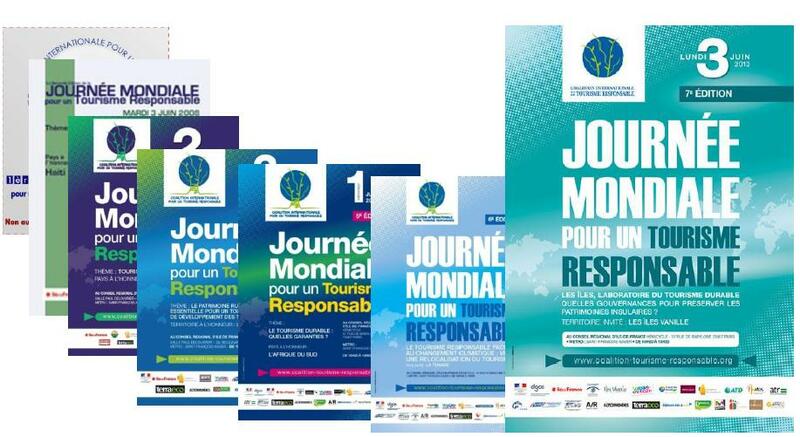 To make professionals, institutions and travellers aware of what is at stake and to prove the necessity and interest to change behaviors and regulations, the ICRT has been organizing a yearly event since 2007: The World Day for Responsible Tourism. Spread over several countries and regions, its topics change every year. Therefore, in these years NGOs and tour operators have gathered to discuss about such topics as the plague of sexual tourism, the fight against poverty, the protection of rural assets, the enhancement of insular destinations (read more at the bottom of the page). For the 8th edition of the WDRT the theme chosen is “Social and fair, values for an innovative tourism”. The symposium will start at 14:00 hrs with 2 round-tables organized in the same time to debate the theme of the Day. Then, we will meet in a friendly atmosphere for a cocktail dinner at 18:00 hrs to sum up the Day. To what extent the values of solidarity, equality of chance to enjoy holidays, or collaborative consumption could help in a new approach to innovative forms of tourism? Is there room for innovation in the social and solidary tourism? Round-table n°1: The future of social tourism: toward new concepts to serve the local economy! Philippe Frémeaux, economic journalist and editorial writer for the Alternatives économiques magazine, will lead this round-table. Gilles Caire, Master of Conferences at the Faculty of Law and Social sciences of Poitier University, Professor of Social Sciences and Director of the professional Master “Droit et développement de l’économie sociale et solidaire” will be the expert on social and solidarity economy and initiatives relating to it. Round-table n°2: Tourism and fair, what are we talking about? Sandrine Mercier, journalist and editor in chief of A/R magazine will lead this table. Philippe Callot, Professor athe France Business School (Centre-Val de Loire University), researcher at Crescem and member of Granem (Angers), is an expert on responsible tourism and solidarity for many years. For each table, many experts on the theme selected will be present to debate. Tourism and solidarity, what are we talking about? The event is organised by Centro Español de Turismo Responsable (CETR) and Asociación Española de Profesionales del Turismo (AEPT) in MADRID (Centro de Turismo Colon). José María de Juan, EARTH’ vice-president, will present the reasons, the objectives and the aim of the World Day for Responsible Tourism. Experiences on social and fair tourism will be exposed in order to foster the exchange of points of views. Jesùs Blàzquez, CETR’ co-founder and co-director, will moderate the debate. The event is organised by Associazione Italiana Turismo Responsabile (AITR). AITR and its members will celebrate the World Day of Responsible Tourism organising several different events all over Italy, from May 31st to June 3rd. The complete map of the events is available here. moments of encounter and engagement, to reflect critically on the concepts of travel and hospitality; migration and global citizenship; inequality and development; sustainability and the best ways to communicate it. The event is organised by Perú Durable SAC, Municipalidad Provincial de Caylloma (Arequipa), Asociación de Turismo de Convivencia del Valle del Colca (Asdeturconv); Asotur Perú y el Centro de Investigación, Desarrollo e Innovación en Turismo (CIDTUR), with the support of the Mincetur, in San Isidro (Auditorio Promperu). The debate will focus on the developments of green tourism, accessible tourism and on the needs for a higher protection and enhancement of Peruvian heritage and touristic resources. Register here. The first edition of the World Day took place on June 2nd 2007, when NGOs and tour operators gathered on the topic « No to sexual tourism, boundless crime». To face this plague, this first World Day was relayed in Cameroon, Burkina Faso, Senegal and Niger. In 2008 the topic selected was: « Tourism as a weapon to fight poverty ». Indeed, in many southern countries, tourism can mean local development and improvement of the local population’s way of life. The best example to show during this 2nd day was Haiti, one of the poorest countries in the world. In 2009 « Tourism and water resources » was the selected topic in order to focus on the importance of developing tourism projects that care for water resources and fight against spillage and pollution. For this 3rd edition of the World Day, Cameroon was distinguished. In 2010: « Tourism and rural assets ». Rural regions are affected by urbanization, ecological and agricultural impacts. Maintaining activities on these fragile and otherwise gifted regions is a key to attract population, economy and dynamism. Pilot projects were used to demonstrate this, namely in the Balkans, with the support of experts. In 2011, the chosen theme was « Sustainable tourism, what guarantees? » While certifications and labels became numerous, it turned out to be quite complex for a Professional to find his way through. Professionals and institutional experiences and initiatives were reviewed, both from actors from northern countries and southern countries. South Africa was in the limelight during a round table debate in the afternoon. In 2012, more than 250 professionals gathered to discuss about “Tourism and climate changes”. Tunisia was the honoured country for this edition. In 2013, the theme was “Islands, Laboratory of sustainable tourism: what governance to preserve the heritage island?” The Vanilla Islands were the honoured territory: they attract more and more tourists and in order to reinforce their attractiveness, to put in common the advantages of insular destinations and to guarantee the enhancement of natural and cultural assets, the concept of “Vanilla Islands” was created. The ICRT is managed by a group of professionals and experts in tourism and sustainable development, experienced in environmental, economic and socio-cultural issues concerned with the tourism industry. ICRT’s think-tank addresses four lines of work which materialize every year in the choice of a specific topic and of current news elaborated upon the Responsible Tourism World Day. To date, ICRT includes over 152 actors in tourism, covering 56 countries. Though working in different fields, each of them is committed his own level towards responsible tourism. CETR aims to organise training activities and to gather initiatives, projects and professionals in responsible tourism from all over the world. It is an initiative by KOAN consulting and RUTAS Pangea. AITR aims to promote responsible tourism, raise awareness into all the stakeholders and foster synergies among its members.